In some parts of the world, any concerns about finding the best towel warmer can seem like a “First World” problem. But it can be a bit aggravating when you get out of the tub or shower and after the wonderful warmth of the hot water you get a damp, cold, and probably even a smelly towel. With a towel warmer, this isn’t a problem anymore. With this appliance, you always get a nice and soothing warm towel to wipe yourself down and wrap yourself up after a bath. There was a time when dedicated towel warmers were considered luxuries, and were only used by exclusive hotels and rich folks. But nowadays these are very affordable, although some exclusive designer brands are also available. In fact, some people also use them for other rooms than the bathroom. It can be used in the kitchen, basement, or bedroom too. It may also have some commercial use too. Salons and spas, for example, need reliable towel warmers not just for the warmth but to help sterilize the towels for customers. This exemplifies the possibilities with the towel warmer, because it can be used to sterilize numerous types of equipment, including glasses and manicure and pedicure implements.Basically, it can heat or sterilize any item you can fit inside to 175 degrees. The inner dimensions measure 8.25 inches deep, 13 inches wide, and 5.75 inches high. That’s enough space for about 32 terry cloth facial towels or at least 70 to 80 disposable facial towels. On the outside, it measures 12 by 17.5 by 12 inches, so you don’t really need much space. It looks very much like a microwave oven. You can use LCL Beauty High Capacity Hot Towel Cabinet as a hot towel warmer, or as a UV sterilizer. Each function has its own separate switches, so you can use them separately and you don’t waste electricity when you don’t need the UV. But you can also use both functions at the same time. The tower grill inside is removable, and there’s an easy-clean drip tray included to catch the condensation from your wet towel. It’s CE-certified for safety, and it uses only 175 watts. There’s a spare UV sterilizer bulb as part of the purchase, although it’s not entirely sure whether this freebie will go on indefinitely. It’s expected to last about a year as it’s very affordable, and in fact that’s how long the manufacturer’s warranty is for. But some reports do say that it has lasted up to 3 years for a few lucky users. 2 in 1 Hot Towel Warmer Cabinet is another hot towel warmer that’s marketed towards restaurants and beauty salons. That’s because the “2 in 1” refers to its towel warmer and sterilizer functions. However, while some people have reported using it for other items, it’s recommended that you use it only for towels. Even in dental offices, it’s used just for warm towels for patients, and not for sterilizing the dental equipment. 2 in 1 Hot Towel Warmer Cabinet is simple to use. Just put in your wet towels, and heat it up. It will automatically sterilize the towel, as it comes with a built-in UV lamp and reflective panels. All the while, it heats up to 175 degrees F. Once it’s hot enough, the unit keeps it warm and toasty until you need the towel inside. The moisture from the towel is collected by the tray. It’s quite small, so it can fit in about 50 to 60 facial towels at once. Or you can put in about 6 hand towels, once you roll them up. It’s modestly sized, and on the outside it measures just 18 by 13.5 by 12 inches. Inside, you get about 13.75 by 10 by 5.5 inches of space. The advantage of this small interior space is that you won’t have to wait long for the towel to warm up to 175 degrees F. It can take only 10 minutes, and in some cases you only need 5 minutes. Also, since it’s for towels then there are no separate switches for the 2 functions. It’s just a single switch, and that’s all you need to worry about. After all, why wouldn’t you want to sterilize your towel in the first place? Here’s 5L UV Heat Towel Warmer Cabinet another towel heater with a UV lamp. The design is a bit different though. Now this is tall instead of wide, and the hinge of the opening is at the bottom instead on at the right side.But for the most part, it works the same way. It’s a plug and play item, and you have separate switches for each function (“power” for heating the towel, and “UV”). Open it and the 5L capacity means that you can put in about 8 facial towels or 19 to 22 disposable towels. It measures 10 inches deep, 8.25 wide, and 11.5 inches tall, so it’s a bit bigger. That explains why it’s a bit more expensive than the other earlier models on this list. It will heat up the towels to 176 degres F, and it’s very efficient because the aluminum material in the inner chamber conducts the heat effectively. It consumes about 200 watts, so it’s not terribly power-hungry. Since it can heat up more towels, it works great for large families or for commercial services that require facial towels. Ever wonder why sometimes a towel is warm on top and cold at the bottom? That’s because Elite Hot Towel Cabinet uses a bulb for the heat source.Sometimes the heating they provide can be inconsistent, and there’s the inevitable problem that eventually it’ll burn out. With the Elite, the heating is more consistent because the padded heating element is spread all around the internal walls. The cabinet is also insulated so the heat doesn’t scape. This is best used for facial towels, and you can fit up to a dozen of them inside. You just have to soak the towels first before you wring them all out. Then you can roll each one and you can place them on the towel rack. It measures 7.25 deep, 10.5 inches wide, and 5.375 inches tall on the inside. It has a water drip pan that collects the moisture from the towels. It really doesn’t take up much space, as on the outside it measures just 11 inches deep, 13.75 inches wide, and 10 inches high. So if you have a small office, it’s very ideal. Just turn the unit on, and in about 45 minutes you get nice hot towels at about 150 to 160 degrees F. It will turn off automatically once it reaches the proper temperature for the towels, so that it doesn’t overheat. Since this is made for facial towels, it’s most suitable for massage services. But you will need to do some planning when you use this, because the 45-minute wait doesn’t work well for impromptu needs. But what if you just want a warm towel, and not a piping hot towel? What if you don’t need to sterilize the towel?For some people, it’s enough that the towel is warm and dry. If that’s the case, then this will work for you. This is a personal towel warmer, and sterilization is not available. In fact, it only heats the towels to just 120 degrees F. It uses a silicone heating element. On the flip side, this means you won’t have to wait for long to get the towel ready for use. It’s about a 10-minute wait, tops. The design of this towel warmer is also a bit different, as it doesn’t resemble a box. Instead, it’s a bit cylindrical in design, like a water glass. It measures 12 inches in diameter at the base, it flares up slightly so at the top it measures 13 inches, and it is 22 inches tall. The cover is transparent, so you don’t have to open it to see if it’s full or not—opening the lid lets out the heat. It’s mostly made for oversize bath towels, and it can fit a couple these towels inside. You can also try putting in a robe or a blanket. Other items you can put in include mittens, gloves, or even hats. So it’s mostly for personal items made of fabrics, and it’s really just for home use. Salon Sundry Combination Towel Warmer Cabinet is one of the most popular and bestselling towel warmers around, and that’s only because of the ridiculously low price (two-digit price, would you believe? ).It’s because it works well, and if it doesn’t the customer support is outstanding. This is another combination unit, which means that it’s a towel warmer and a UV sterilizer. You can use either or both, as each comes with a separate switch. The heater uses the 200-watt power to get the towels to reach 176 degrees F.
The germicidal UV bulb kills microorganisms, and it shut downs automatically when you open the unit door to protect your eyes. The unit comes in a metal cabinet with a cool-touch door and a magnetic latch. The door is double-sealed to minimize heat loss. There’s also a drip tray so it can collect the moisture from wet towels. It has a detachable wire basket that fits inside, and the interior measures 9.75 inches deep, 13.75 inches wide, and 5.375 inches high. It can fit up to 40 very small facial towels. It works fast when heating, although you may have to change the UV bulb often when you use it regularly. However, it’s so affordable that you can’t expect it to work flawlessly for a long time. It’s for personal use, and it’s not reliable enough that you can trust it with your business. Once again we have a combo of towel warmer and UV sterilizer. The features should be familiar: separate switches for the heater and UV, detachable water tray for the moisture from the wet towels, a temperature setting of 176 degrees F.
What’s great about the TISPRO SX1000 Hot Towel Cabinet is that it has a larger capacity than most, as it can accommodate up to 24 regular face towels. Open the door and you’ll see 2 shelves inside. The shelves re removable, so you can fit in more if you want to. It’s a rather substantial unit, as it measures 10.5 inches deep, 17.75 inches wide, and 14 inches high. You can fit in quite a few regular bath towels there. Once you put your towels in, then it’s a 30-minute wait for the unit to heat the towels properly. It’s a great unit for personal use. It’s not really all that big, and at 17.2 pounds it’s not all that heavy either. It’s easy to clean too. Some people use it for their massage or salon business, and they report that it works very quickly when left on all day. This is another combo unit geared towards facial towels.Pursonic Towel Warmer also comes with a UV sterilizer function with a separate switch. The heater warms up the towels to 176 degrees F, after which it maintains a temperature within a range of 158 to 175 degrees F.
Pursonic Towel Warmer works best with facial towels, and you can fit about 12 of them inside the chamber. Or you can out in up to 40 or so small washcloths. You still have to pre-soak the towels, and after you wring them out you can then roll them all up when you put them inside. The chamber measures 7.7 inches deep, 10.7 inches wide, and 5.6 inches high. On the outside, it measures 11.1 inches deep, 13.8 inches wide, and 10.1 inches high. It only weighs 8.8 pounds, so moving it from one room to another isn’t a problem at all. It does take a while to warm up, as you’ll need an hour. But afterwards it heats up towels fairly quickly. It’s probably more effective to just keep it on all day, especially if you’re using it for your salon or massage business. It’s CE-certified and it only uses 130 watts, so you don’t use up too much energy when you decide to leave it on and keep your towels warm all day. If you’re using the towel warmer for your business, then it can get confusing as when they say that a certain number of towels can fit inside—and then you can’t make them all fit. Are you using the right towels? Here, this LCL Beauty Black hot towel cabinet is supposed to fit in 70 to 80 disposable facial towels, or 32 terry cloth facial towels. Which towels should you get? If you’re running a salon or massage business, then you’re in luck. This purchase also comes with 24 “salon-quality” facial towels. And you know for a fact that they can all fit at the same time inside the towel warmer. There’s even a bit of space on top for smaller washcloths. On the inside, it measures 8.25 inches deep, 13 inches wide, and 5.75 inches high. Its features are the same as the other LCL unit we’ve already mentioned at the start of this list. 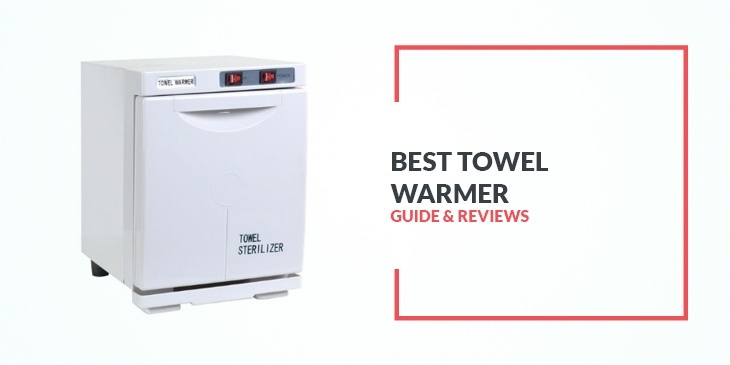 It’s CE-certified, the tower grill and the drip tray inside are removable for easy cleaning, it heats towels up to 175 degrees with its 175-watt heat, and the UV function has a separate switch. It also measures 12 inches deep, 17.5 inches wide, and 12 inches high on the outside. The other main difference is that while all the other models here are white in color, this one is in black. Now if you have a very busy salon and you keep needing hot towels on a regular basis, you can’t afford to wait.And you can’t afford to not get this nifty unit, which is doubly a 2-in-1 model. That’s because it’s not only a towel warmer and UV sterilizer combo. LCL Beauty High Capacity Double-Decker Cabinet also comes with 2 heating chambers. This means that you can open one chamber to get the towels, while the other chamber remains closed so you don’t let the heat out. Each chamber measures 10.5 inches deep, 13.5 inches wide, and 5.5 inches high. The total internal volume is 22 liters, and in practical terms you can fit in more than 140 disposable facial towels or 64 terrycloth facial towels. For most households, a reasonable price for a towel warmer is for less than $150. But some models go for twice that price, and hotels may use towel warmers that can cost thousands of dollars. In general, the most convenient model is freestanding, and you only need to plug it in since it uses electricity. This means you can move it from room to another with no trouble. But other models need to be mounted to the wall or the floor. Sometimes they’re “hydronic” models, and this means they need to be wired to your hot water plumbing so that it can produce the heat for the towels. These types of models and installations require professionals. How many towels can it heat all at once? For salons and inns, this is an important question because customers may need lots of towels. How fast can it warm up a towel? People don’t like to wait for a hot towel, especially customers. But even home residents can get annoyed when the towel isn’t warmed up yet when they’re done bathing. However, since many of these units consume only as much electricity as an average light bulb (maybe 60 watts), the most efficient way to use it is to just leave it on. You won’t waste time for the unit to warm up (which can take 15 to 30 minutes) and you only need the warmth to radiate through the towels (35 to 45 minutes). Can it sterilize the towels? Some can also come with UV features so that it can really sterilize the towels properly. In fact, it can be used for manicure and pedicure equipment, dentist tools, restaurant implements, and other similar items. Others also have timers and automatic shutoff features. For the most part, the cheaper ones tend to last for about a year and then you have to replace it. But the more expensive ones tend to last longer. Of course, it’s a gamble. If you’re lucky, then you can get one cheap and it’s last for 3 years or so. And you can be really unlucky and spend a lot on something that doesn’t last all that long. Towel warmers can come in all sizes and styles, so you can find one that can fit the look of your bathroom. But in general, if you’re just looking for a basic unit then you can find one that looks simple and nice enough. Most of the time, they look like microwave ovens although some resemble small cabinets. Many businesses require these towel warmers, such as salons, barbershops, and spas, and with the right one you can really make your customers feel special. But with the right UV function, you can also sterilize tools as well. That expands the number of businesses that can really use this product. Dental clinics, restaurants, gyms, nurseries, and nightclubs can all make use of the right towel warmer. And of course, there’s home use too. Can you imagine the feel of a warm towel after an invigorating shower or a languid bath? Now you don’t have to imagine it at all. This isn’t a luxury item. You can use them for your utensils and for your blankets in the cold season. At this price range, the best towel warmer is an accessory that you can afford (and deserve) to enjoy.